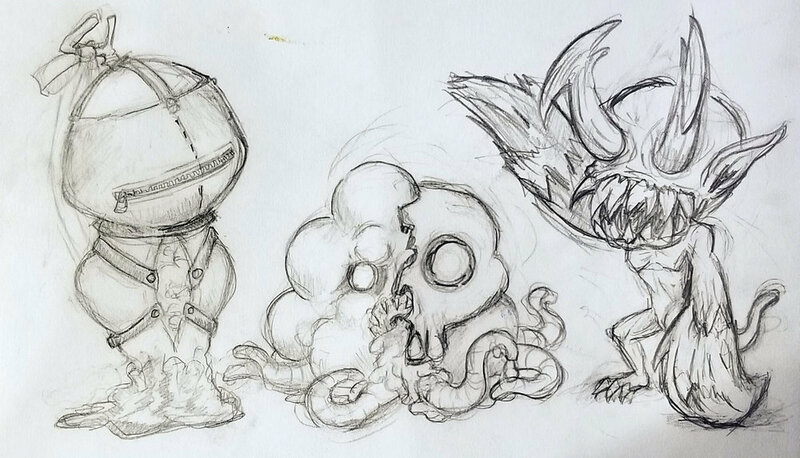 If you haven't checked out my Monster Gods yet, I have three gods of monsters- Agony, Wretched, and Maim, and these are designed to be creatures spawned directly from those beings. They act according to the will of their patron gods (i.e. Maim's thrall destroys, Agony's Thrall creates madness, and Wretched's Thrall decays) and work as their servants on the mortal planes. In theory, the thralls could take many forms, but I made a design for a thrall of each god to sculpt and cast in resin. The Thralls as baby sketchlings! Here's the concept sketch I did for the thralls. Obviously, they went through a few changes in the sculpting phase. While I won't detail the entire casting process here (I probably will at a later date) it was pretty difficult considering my relative newness at this kind of casting. However, these turned out being some of the first monsters I've cast that I've felt really PROUD of the result of. The other good news is that I've just opened up the beginnings of my shop here on the site! You can buy Thralls with other Monster God goodies HERE! With these thralls, I'm starting to feel much more confident as a resin caster and like I've really developed as an artist. Thank you to everyone who's supported me!